What a great time to be a 4X fan. Arcen Games, the indie studio behind the beloved AI War, has just announced a new planet-colonization game called Stars Beyond Reach. In keeping with Arcen Games’ history, it sounds daring, ambitious, charming… and incredibly hard to pull off. But looking at some of the frankly batshit-sounding features that designer Chris Park lists in the announcement post, it should be something unlike anything else out there. Sound like a tall order? Trust me, you don’t know the half of it. The objectives Park lays out in this announcement post are inspired, but almost mind-numbingly difficult to comprehend. For instance, you’re dropped onto a planet with a 14 different races, of which six are AI-only. There are also eight different languages that the races speak, which means that a lot of the races cannot understand each other when the game first starts. Not that you should let that keep you from attempting diplomacy! I just read that and my jaw drops. You and the other races are basically going to be trying to conduct international diplomacy in the dark, when you might only have a handful of words and phrases you can mutually understand. It’s a terrific idea, and I have NO IDEA whether Arcen can make it work in practice. But Park is definitely saying all the right things. He points to Civilization: Beyond Earth’s reviews to explain why he’s putting so much emphasis on giving his factions and leaders distinctive personalities that you can identify during gameplay. But Arcen are also trying to create tons of variety in the game, so each faction can have three different leaders with different personalities. Here’s another neat twist: Stars Beyond Earth is set in the same universe as AI War and The Last Federation, so you’ll be able to identify ties between the three games. The races are pretty diverse, and the AI-only races break the rules of the game in strange and exciting ways. What I love the most about this project, however, is just how much it sounds like a newer and more ambitious Alpha Centauri. 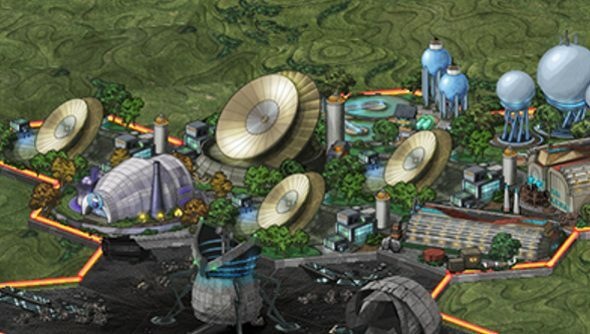 From the emphasis on personalities to the fact that there’s a variable climate and terraforming options, Arcen seem to be picking up all the threads that have been abandoned in intervening years because they are too complicated. And of course, the planet itself is a character in the story, one that receives a rather menacing trailer all its own. That’s not a surprise, coming from Arcen. Complexity is something they don’t shy away from, which is why their games can be superb or completely obscure, but never dull. This might be a waste of a perfectly good hexgrid, but I’m not sure. There’s something I like about this approach: 4X games sometimes obsess too much about military units and maneuvering. The truth is that, at the national level, military power is simply an expression of how you have approached science, economics, and politics. How often have you found yourself just spamming units until you finally crush your opponents? I’m intrigued by how Arcen are trying to eliminate that tedium and keep the focus on empire management. With Beyond Earth, Endless Legend, Galactic Civilizations 3, and Pandora out there, we aren’t wanting for sci-fi 4X games. But it’s exciting watching people stretch this genre in new directions, and Stars Beyond Reach sounds like its determined to stretch it to the breaking point. And then I guess we’ll see what happens.